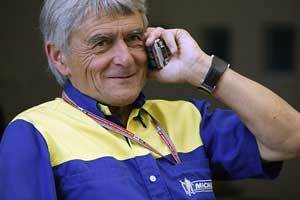 Small in stature he may be, but Pierre Dupasquier is a giant figure in the world of motorsport. The director of Michelin's Competition Department for 30 years, Dupasquier is a highly-respected figure not just for his technical knowledge and experience but also because of his skills as a manager and a motivator. Dupasquier joined Michelin after serving as a fighter pilot with the French Air Force. He started out in the research division in 1962, spending five years working on tyre development before moving to Paris in 1967 to work in liaison between Michelin and its automobile company customers. In 1973 he was appointed to head the competition department. Since then Michelin has collected dozens of Wiorld Championships with motorcycles and cars. In 1977 Dupasquier led Michelin into F1 to launch Grand Prix racing's first radial tyres, the following year the company scored its first victory when Carlos Reutemann drove to victory for Ferrari at Jacarepagua in Brazil and in 1979 Jody Scheckter became Michelin's first Formula 1 World Champion. In the five years that followed Michelin won 59 races, three Drivers' titles and two Constructors' Championships. After Michelin withdrew from Formula 1 at the end of 1984 Dupasquier was appointed vice-president of product development for Michelin in the United States and he stayed there for six years. When he returned to France Michelin asked him to take up his former role as head of the competition department once again but it was not until 1999 that he was able to convince the company that it needed to be back in F1. Dupasquier did a deal with Williams for tyres in 2000 and added Toyota, Jaguar, Benetton (Renault) and Prost in 2001. McLaren joined the Michelin fold in 2002.